Join us in the Library on Thursday, November 15th at 4:00 pm for our Teens REACT Program. 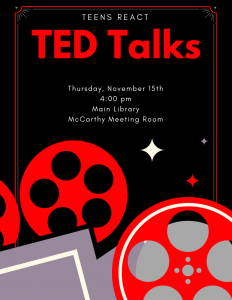 We will make popcorn and watch and discuss TED Talks in the McCarthy Meeting Room. The talks will surround November’s theme of poverty and food insecurity. No registration is required, and all tweens and teens are welcome to attend! If you are able, please bring a non-perishable donation for our food pantry.